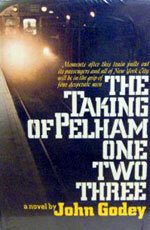 adapted as "The Taking of Pelham 1 2 3"
Four men seize a New York City subway train, and hold its passengers hostage. The identities of the hijackers are unknown. Their demands seem impossible. Their threats are real. Their escape would seem inconceivable. Only one thing is certain: they aren’t stopping for anything.